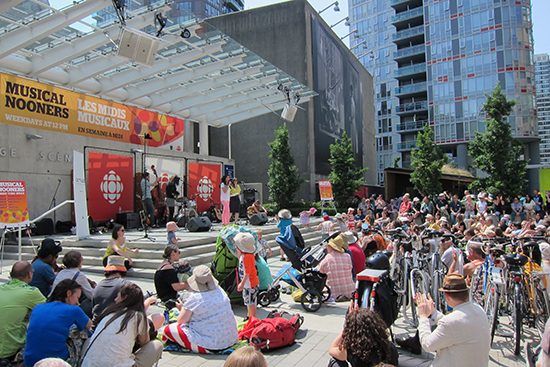 The Fifth week of the free summer concert series, Musical Nooners at CBC Vancouver, features Kids’ Day on August 2 with CBC Kids performer Will Stroet. This free concert series runs every weekday from noon – 1pm on the CBC plaza at 700 Hamilton St.
With a newly released second album, the Saskatoon singer-songwriter brings her unique folk vocals to Vancouver. With one guitar and one voice, enjoy the storytelling of Cameron's lyrics. Bring your kids for this special activity-filled day - from noon to 2pm! Children's performer Will Stroet of Will's Jams from CBC Kids will be on stage to delight young fans and their parents alike. Guests can mingle with mascots Scout from CBC Kids' and Parka from Parks Canada, make creations at the craft centre and participate in an adventurous scavenger hunt. Now in its 8th year, the Musical Nooners free concert series runs Monday - Friday, from noon to 1pm, at the CBC Broadcast Centre at 700 Hamilton Street (between Robson and Georgia) from July 7 – August 25. For more information on the Musical Nooners series and CBC in British Columbia, go to www.cbc.ca/bc or follow us on Twitter @CBCVancouver or #musicalnooners.